THE formula for the perfect family fun bike – which I define as a machine suitable for as many members of the family as possible – is that it must be fun to ride, easy to maintain and as reliable as possible. Everything else is padding. The TT-R125LWE and TT-R230 are listed on Yamaha’s website in the ‘fun’ and ‘trail’ categories respectively, although I think they are also excellent machines for most of the family. For getting around the property at a sedate pace, for keeping up with the little ones while they learn to ride and for simply exploring the bush, either bike is fine if you’re the right size. 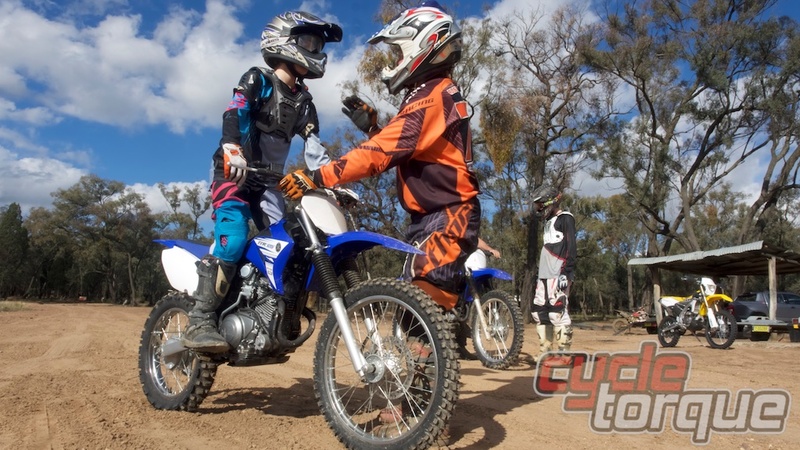 Younger riders will see them as stepping-stones to bigger, more powerful and more capable machines, and that’s who they will be mainly bought for – youngsters looking for easy bikes to learn on, pre-teens and teenagers who haven’t gone down the motocross path to learn to ride off-road. Both machines offer economic ways into motorcycling – not just reasonable purchase prices, but they are cheap to own, too: they hardly use any fuel, maintenance is dead-easy, they are cheap to fix when they are inevitably crashed and the resale values are fantastic. 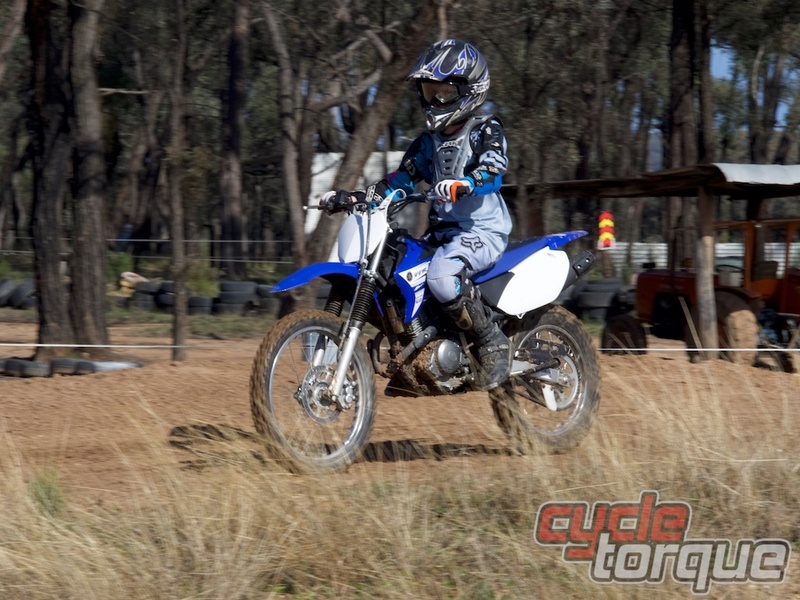 Matthew, 11, rode the Yamaha TT-R125LWE for Cycle Torque. Although he has ridden before – he’s had a play on Oset electric bikes and a Kawasaki KLX-110 and even did a riding school on a 50cc machine a few years back – but he’s not a keen rider. He took to the TT-R125 though, surprising everyone with his ‘mastery’ of the clutch and enjoyed himself immensely. Personally I was surprised he managed the clutch so well – it’s been a major bug-bear to his older brother, who never really mastered the clutch on his Honda motocross bike, constantly stalling and then having to kick-start putting him off the machine before he got to know it. Matthew, on the other hand, won the bet with Damien about how he would be able to ride a bike with a clutch, and he didn’t have any real problems with gearshifting, too, and when he did stall the electric start had him going again in no time. Yamaha build a variety of TT-R125 models. They all have an air-cooled four-stroke motor and YZ-F motocross-inspired styling, but they aren’t motocross bikes. 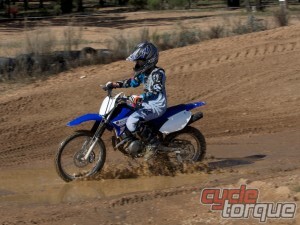 That said, a youngster learning how to ride can have a lot of fun riding a motocross track, because the surface is usually predictable, they can roll over the jumps and see where they are going. However, if they start getting lots of airtime, you might want to consider trading up to a competition machine. There’s no high-tech here. The styling might look racey, but the design brief was to make the TT-R125 versatile and inexpensive, so there aren’t fuel injection, liquid cooling, titanium valves or remote-reservoir shocks here – a 20mm carburettor provides the fuel, the cylinder has fins for cooling, there is just a single camshaft and two steel valves in the head. There’s even a manual choke! If anything is going to trip-up the modern parent here, it might be things like this. I haven’t had a car with a manual choke for decades, and it won’t start from cold unless you get the basics of choke on, throttle off, neutral, press button… but really, it’s a dirt bike. If you’re buying one, for yourself on the hobby farm or for a kid to have fun, you need to learn a little – safety, starting and basic maintenance, which I can sum up in a single sentence – Wear a helmet and suitable protective gear, lube your chain after every ride, have the machine serviced when it’s due and read your owner’s manual, especially the parts about using the right fuel, understanding the fuel tap and starting. 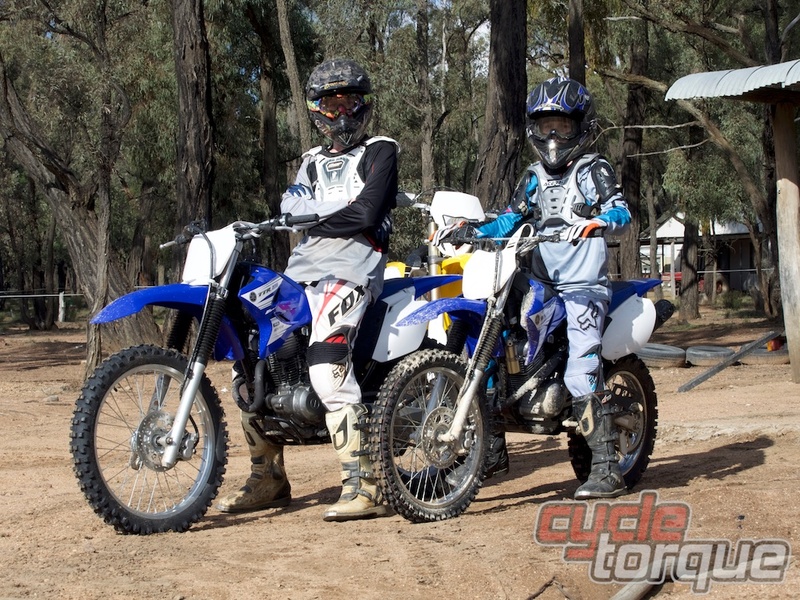 The Yamaha TT-R125 will suit riders from about age 10. That would be the TT-R125E with a 17-inch front wheel and 14-inch rear, and a drum front brake. There’s also the TT-R125LWE with 2-inch bigger wheels, stiffer suspension, a front disc brake and an aluminium swingarm, which is more robust and lighter than a steel swingarm. The larger model will also suit shorter grown-ups looking for an easy bike to get around on and teenagers looking to learn. Bridging the gap between a kids’ bike and a full-size trail bike, the TT-R230 occupies a spot in the market ideal for teens, smaller grown-ups and learners of most sizes. It tips the scales at 116kg, and the seat height is 870mm, which combine to make the machine easy to handle. 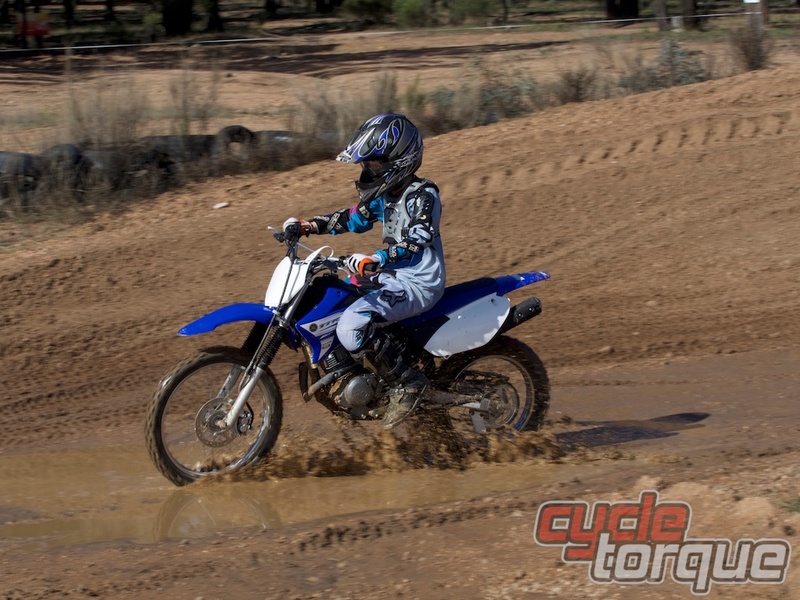 The ground clearance and motocross-style flat seat means youngsters can learn good technique which they will be able to apply when they outgrow the physical size of the TT-R230 or their ability requires them to move on to something more capable and undoubtedly more expensive. The TT-R230 is designed to be very easy to live with. Yamaha has been building single-cylinder four-strokes for decades and they are a very proven engine. There’s a six-speed gearbox and a heavy-duty clutch, too. It’ll go all day on the 8-litre tank. The suspension is simple and plush, designed to be comfortable and forgiving. Tyres are knobbies on full-size 21-inch and 18-inch rims and there’s a disc brake at each end. Our test rider loved the TT-R, but really he was too experienced, too gung-ho and almost too big, being a tall 15-year-old. Damien loved his KLX110 (when he was nine) but really didn’t take to his next bike, a Honda CRF150R (when he was 12). The CRF is a motocross machine and the KLX didn’t prepare him properly for its narrow clutch take-up, high performance, high-revving engine and tall seat. Add in a lack of opportunity to ride the bike and he never got the hang of it – and he’s outgrown it now, too. The TT-R230 is none of these things. It’s dead-easy to start, thanks to the electric leg. It’s also dead-easy to ride, thanks to an engine built for mid-range torque rather than top-end power, a moderate seat height and relaxed trail bike ergonomics. 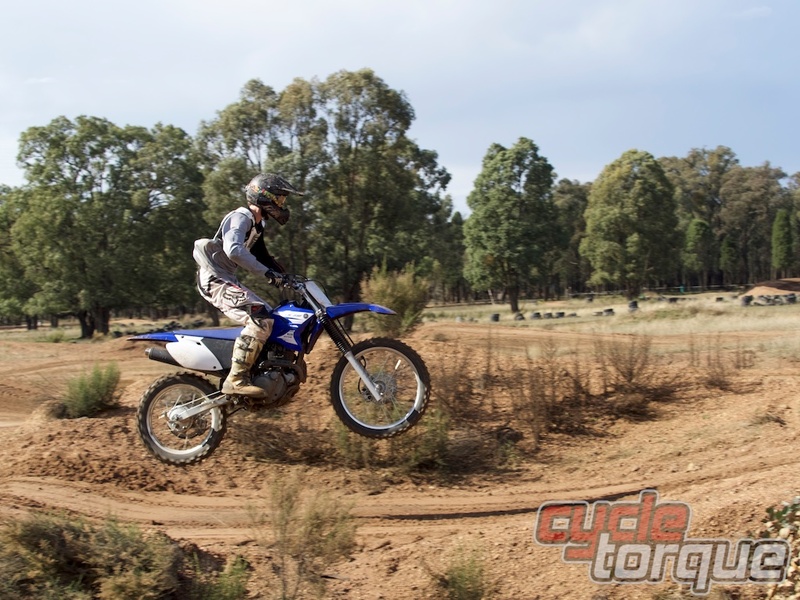 It’s a trail bike rather than a motocrosser and as such it’s much easier to ride, requires a lot less maintenance and retains its purchase price better, too. For the test we had two days out at the Free Flight Motocross Park, where owner and motocross trainer Steve Jacobs helped both our ‘testers’ with their techniques. Damien was pretty adept on the TT-R230 anyway, riding around the various tracks at Free Flight restoring his confidence after not riding for six months or so. Once Steve started giving him some tips, Damien was soon doing small double jumps… which the bike coped with admirably, but is starting to get beyond the design brief. 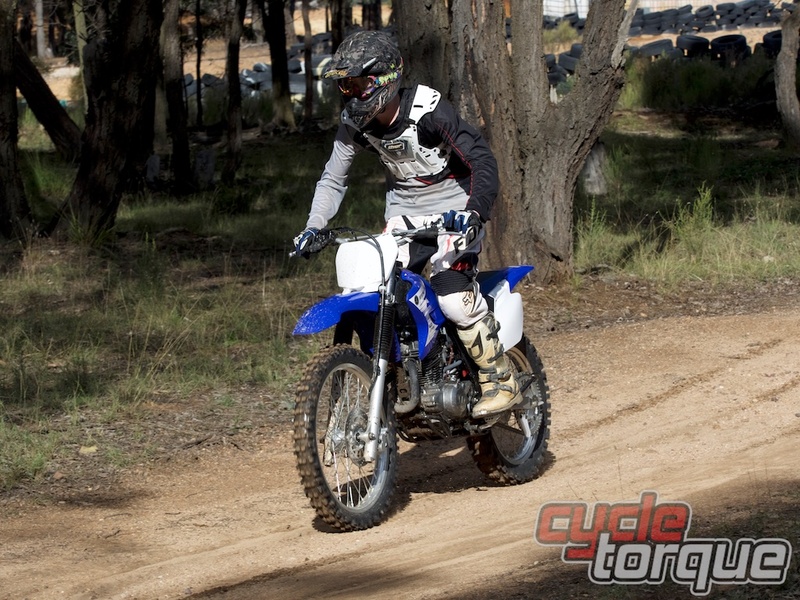 Of course, learning motocross techniques – and being physically a bit big – meant Damien started crashing his brains out, which the bike coped with admirably, again – scratched plastics sure, but nothing broke and the bike started easily enough after each time it had a rest on its side. 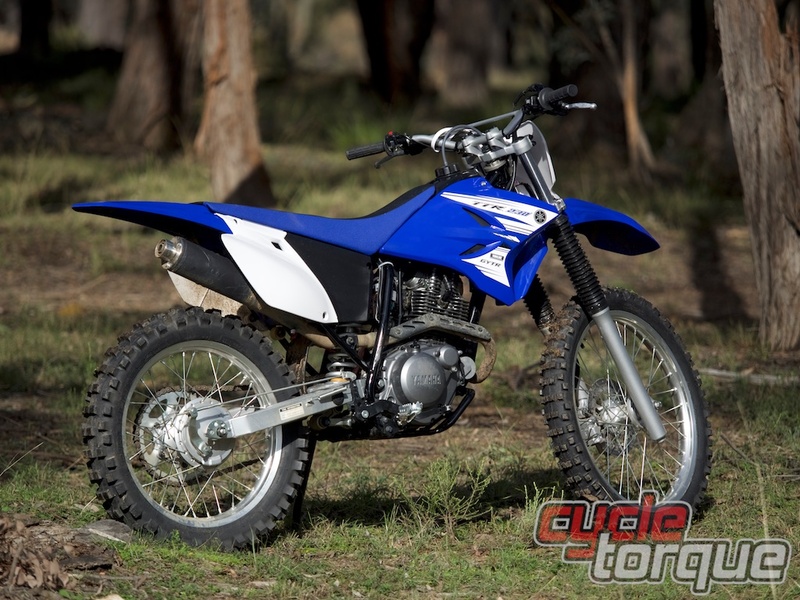 Damien’s 15, tall and lanky – he really needs a full-size bike like an XT250, which is a step-up in size, performance and ability – or go back down the competition path with a YZ125 (two-stroke), YZ250F (four-stroke) or an enduro machine like a WR250. Yamaha had loaned me a WR520F to take along while testing the two TT-Rs, so I’d have something to ride. Damien had a ride of the WR and he found the experience a little intimidating, for it was easily the biggest, heaviest and most powerful bike he’d ever ridden, but he came back pumped by the experience and keen to do more riding. The TT-R230 had done its job – given a young rider the confidence to push their limits, to get more experience and get him ready for something bigger and faster.